Avg. Group Discount of 13.4%! The Willard InterContinental is located in the heart of the nation's capital on Pennsylvania Avenue near the White House, the Smithsonian museums and the downtown business and theatre districts. The Willard epitomizes world-class hospitality as the hotel of choice for heads of state and leaders of the world's business, cultural, social and political elite. The hotel's 334 well appointed large guestrooms include 40 elegant suites. Dining options include Café du Parc, the popular French bistro with seasonal outdoor seating and traditional Afternoon Tea in Peacock Alley. The luxurious Red Door, Elizabeth Arden at the Willard, offers a wide array of pampering treatments. The classic Willard InterContinental combines heritage and luxury with contemporary comfort and the latest technology. An American institution, the Willard has hosted nearly every U.S. president since 1853. It was at the Willard that Julia Ward Howe wrote The Battle Hymn of the Republic, where President Ulysses S. Grant popularized the term “Lobbyist,” and where Rev. Dr. Martin Luther King finished his renowned "I Have a Dream" speech. 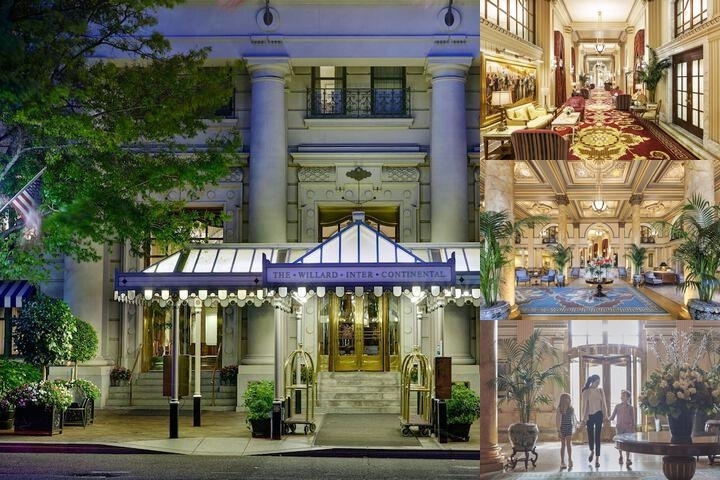 Recently awarded the International Hotel & Restaurant Association's Environmental Award for Sustainability, the Willard has embarked on a Sustainability program entitled, "Willard InterContinental - The Next 100 Years." The holistic plan is comprised of numerous interwoven sustainable projects designed for a luxurious urban hospitality experience in harmony with social and ecological consciousness. The Intercontinental Hotels and Resorts highlights above are subject to change without notice. 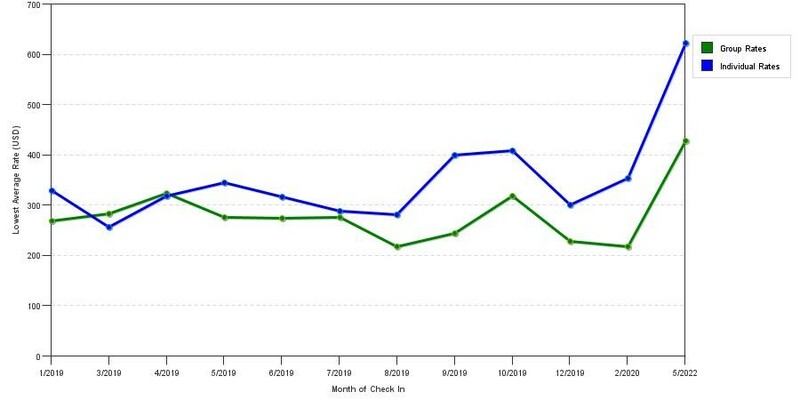 The graph above is averages of room rates for both our group quotes and the lowest online individual rates we could find at the time the group/meeting offer was entered. The best group deal shown is 39.0% in September 2019 and the highest average individual rate is $761 in the month of September 2018. This chart will show past seasonality and also project future months. If you are flexible with dates, you may want to consider staying at Willard Intercontinental Washington Dc in a month when rates are lower. Below are the meeting, banquet, conference and event spaces at Willard Intercontinental Washington Dc. Feel free to use the Willard Intercontinental Washington Dc meeting space capacities chart below to help in your event planning. Hotel Planner specializes in Washington event planning for sleeping rooms and meeting space for corporate events, weddings, parties, conventions, negotiated rates and trade shows. 31 x 15 x 9 Ft.
78 x 40 x 19 Ft.
34 x 34 x 9 Ft.
26 x 16 x 8 Ft.
25 x 16 x 8 Ft.
32 x 32 x 8 Ft.
74 x 64 x 18 Ft.
64 x 40 x 15 Ft.
26 x 16 x 9 Ft.
30 x 26 x 8 Ft.
32 x 16 x 8 Ft.
36 x 25 x 8 Ft.
64 x 31 x 9 Ft.
34 x 30 x 9 Ft.
162 x 17 x 13 Ft.
29 x 20 x 8 Ft.